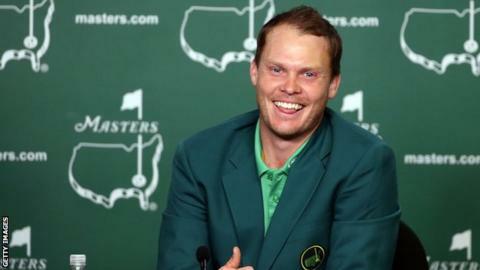 Danny Willett has come a long way since he swung his first golf club on a family holiday in north Wales aged 11. The 28-year-old from Sheffield is now the Masters champion, Europe's first winner of the Green Jacket in 17 years. Speaking to the people that know him best, BBC Sport has traced his incredible journey from being the toast of Bondhay Golf Club to the king of Augusta National. It was his father, the Reverend Stephen Willett, who got a young Danny into golf on a family holiday to Anglesey. "By the time he was 12 he was out-driving me by 70 yards," said Rev Willett, speaking to Radio 4's Today programme. "But it wasn't just his play. He understood things like shaft rises and stiffness and he just knew about golf. "I stopped playing with him after a while because it was embarrassing." Rev Willet would allow his son to miss school, taking the youngster to a golf club until 8pm, which would cause disagreements with wife Elisabet. "He used to write the most appalling excuses for school," said Elisabet. "He used to say 'Danny wasn't in school yesterday but he's here today' and that used to be it for years and years. "But the better he got, the more the PE department supported him so the school, in the end, was fantastic." Manager Andrew 'Chubby' Chandler credited Willett's parents for his character: "He's a confident lad, he has been brought up unbelievably well. His dad is a vicar and his mum is Swedish, it's a nice mixture of the two. Danny does things right, says his please and thank yous." Willett was able to cope with the raucous crowds at Augusta cheering on the home favourite Jordan Spieth, a skill that he honed on the golf courses of Sheffield. "It wasn't the quietest of places to hit golf balls," said Sheffield PGA golf coach Peter Ball, who coached Willett between the ages of 12 and 16. "Even on the green you couldn't guarantee having a quiet putt. We used to have a lot of fun out on the course and we still do. "He was one of a number of young people who turned up on a regular basis, hitting golf balls. Then he decided he wanted to do a little bit more practice, separate from the others. His drive and his determination was amazing." Willett joined Bondhay Golf Club as a junior, before playing at Rotherham aged 17. He is still a member of Rotherham, but also plays at Lindrick Golf Club in South Yorkshire, a club that also boasts former world number one Lee Westwood as a member. Club captain Tony Grayson said: "He was an excellent amateur and always destined for great things." Willett left school at 16 and later attended Jacksonville State University in Alabama on a golfing scholarship. James Hobbs, his coach at Jacksonville said: "When Danny came he was a physically immature young man and basically we got him two years of college and two years of playing competitive golf. "We introduced him to some workouts, tried to build him a little bit of strength and stamina and gave him a great golf course to play and practise on every day. So I think Danny will even agree it was a platform where he could launch his golf career. "He had ambitions to be a PGA professional, a European Tour professional and the college experience for Danny was one where he got stronger. He was able to manage his game to the point where he began to believe that he could go out and play any type of golf course and play against any type of competition. That was evident the way he attacked at Augusta National." "I had a text on Friday morning saying he was not sure if he would play," said Grayson. "He did not arrive until the Tuesday morning and had limited practice time but perhaps that was not a bad thing." Coach Mike Walker said: "He got there a day later than would have done had he not had Zach. He is constantly prepared, he never comes out of playing mode." Like many watching at home, Walker had gone to bed as defending champion Spieth led by five shots at the turn. "I went to bed when Spieth birdied nine because I had a 4.30am alarm call," Walker said. "But then my phone started going bananas. People were texting me to say you best get back up, it was a very exciting night in the end." Spieth found water twice on the par-three 12th as he dropped six shots in three holes and saw his lead crumble from five ahead after nine. "It was brilliant," said Danny's brother Pete of Spieth's capitulation. "I don't wish bad on him - now - but before, when he went into the water I felt for him but it was the best thing I had ever seen." Former England cricket captain Michael Vaughan is good friends with Willett, he said: "He's a great lad - great for English sport, great for Yorkshire golf and everyone from Sheffield and Rotherham where he's from are very, very proud of what he's achieved." "When he won in Dubai (in February) I said you are 11th in the world and he said, well that is 10 to go - he thinks he can get to number one," added Chandler. "He will not be distracted, this is just the start of the journey." Willett will return to Augusta next year as a defending champion and will choose the menu for the Champions Dinner on the eve of the tournament. That means Spieth, Tiger Woods, Jack Nicklaus and Bubba Watson might just be tucking into some Yorkshire pudding next year.